The battle for the most talented players raised due to the liberalisation of the player labour market and tremendous revenue streams in several national competitions. This context is stimulating the quest for professionalisation with regard to talent development. At the same time, there is a need for a European standard for profiling high quality and productive Academies. By means of doctoral research, the double pass Talent Development Framework has recently been optimised by an exploration phase, a quantitative survey (85 Academy Managers from more than 35 countries) and semi-structured interviews with 20 Academy Managers. Clubs were classified as <10 million, 10-50 million, 50-100 million and >100 million euro revenue to reveal if certain standards were revenue-dependent. A first element is the inside-out perspective which refers to the resources and processes that lead to organisational effectiveness. Bringing resources (e.g. staff) together with processes (e.g. 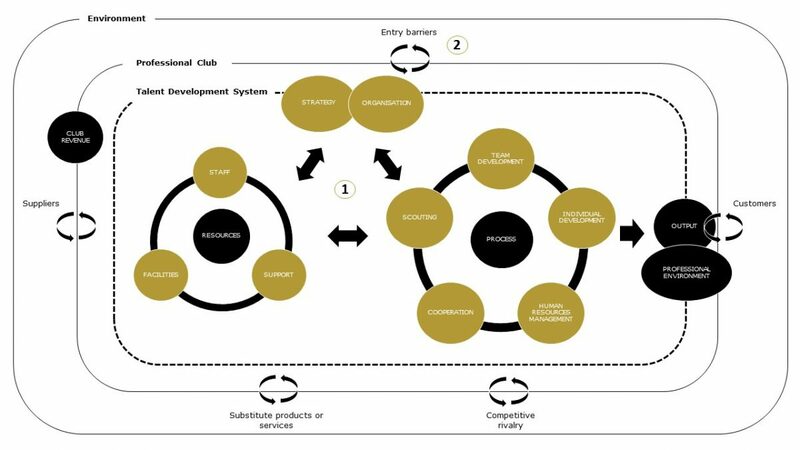 individual development) enhances the organisational capacity of a professional club. A second element is the outside-in perspective based on the model of Porter (2008). The analysis of the professional environment gave a broad description of influencing factors on talent development in a European context. The five forces (e.g. suppliers) are indicated on the framework.